Plate two from '24 Views in Indostan by William Orme'. This aquatint was prepared Richard Bankes Harraden (1778-1862) after an original by Francis Swaine Ward (1736-94). 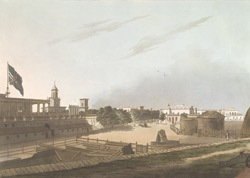 Fort St. George was established by the British East India Company in 1644, and to this day, the old fort contains a mixture of seventeenth and eighteenth century structures. The buildings in the foreground of this picture are the barracks. Behind the barracks, just to the right of the Union Jack flag, St. Mary's Church is visible. This church was built between 1678 and 1680, and is the oldest building in India associated with the Anglican Church.